Tourist: How do I get to Carnegie Hall? Taxi Driver: Practice, son, practice. Or you can go the way of Florence Foster Jenkins and have enough money to rent the hall oneself. In the 1960’s, a Margaret Dumontenesque like singer going by the name of Mrs. Miller become a flavor of the month sensation by singing pop songs like Downtown in an operatic off key shrill. I have a memory of Mrs. Miller from my youth. I did wonder at the time whether she knew she was being laughed at, not with. Apparently she had some idea, but that didn’t stop her from recording. Such a character appears in pop culture every once in a while (anyone have a painting of a poor orphaned waif with saucer eyes?). And now a new movie has been made about a similar creature who shared her voice during the days leading up to World War II. The main difference is that Florence Foster Jenkins made Mrs. Miller sound like Leontyne Price. 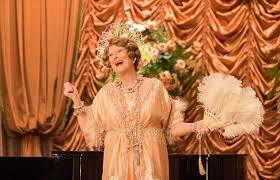 The film Florence Foster Jenkins is written by Nicholas Martin and directed by Stephen Fears and never really comes together in a satisfying way. If I were to say why it doesn’t work, I would probably describe it as the filmmakers found a fascinating but forgotten true story, but then couldn’t quite figure out what to do with it. 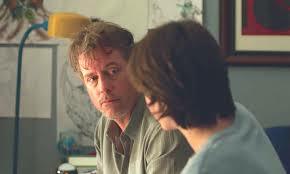 For example, the highpoint of the movie, the one scene that really takes off and rises above what it is, revolves around Jenkins’ husband, St. Clair (played by the semi-retired Hugh Grant). He comes home to his apartment, which he keeps separate from his wife’s home, to find a party in progress hosted by his mistress Kathleen (Rebecca Ferguson). She persuades him to join her in a lindy hop type dance and suddenly the movie soars. But this scene has absolutely nothing to do with the rest of the film. It succeeds almost entirely in a vacuum. Harboring a guess, most likely what happened is that the filmmakers may have hamstrung themselves by trying to stay too close to the facts. Facts are nice as far as they go, but in fiction, it’s not always best to let them have dominion over the story. A few months ago, a French film Marguerite (title role played by Catherine Frot, who won a César for her performance) based on the same character, reached American shores. But it was set in Paris at an earlier time period. Setting themselves free of having to worry about the facts (names were even changed), the filmmakers created a focused and deeply moving character study. In the U.S. version, everything feels both carefully modulated, yet cobbled together at the same time. This also includes Meryl Streep’s performance in the title role. She’s certainly not bad (which I’m not sure is ever possible for the incomparable grande dame), but she’s not particularly interesting either. It often feels like she is filling in the colors in a paint by numbers kit. 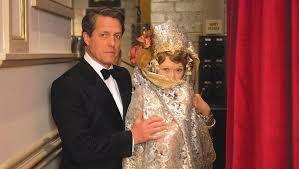 Hugh Grant seems to be a bit more relaxed and buoyant as the husband. St. Clair and Francis not only never had carnal knowledge of each other (Florence had the French disease, shades of Out of Africa), she pays all his expenses, as well as the apartment where he sleeps…with his mistress. That the filmmakers paint him as a loving husband rather than a gigolo is a neat trick, but Grant makes it work. 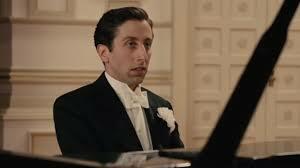 Simon Helberg (of The Big Bang Theory) plays Florence’s pianist, and has some first rate double takes (he also plays his own piano). With Christian McKay as columnist Earl Wilson, John Kavanagh as Arturo Toscanini and John Sessions as Dr. Herman. There is nothing really wrong with Little Men, the new film from writer Mauricio Zacharias and writer/director Ira Sachs. Like the previous collaboration of the two filmmakers, Love Is Strange (a remake of the 1930’s film Make Way for Tomorrow, but this time with the married couple being two men), it’s a perfectly satisfying independent piece of filmmaking. But I’m not sure I can say it’s any more than that. The story revolves around two families. Brother and sister, Brian and Audrey Jardine, have inherited a Brooklyn home when their father dies. Brian, a struggling actor, moves into the home with his wife Kathy and young son Jake. 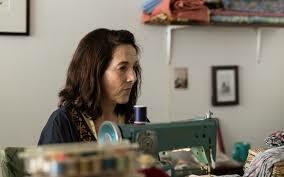 At street level, the building also houses a dress shop run by Leonor Cavelli. But the shop is struggling as much as is Brian’s career. In addition, Brian’s father had not raised the rent in several years. But the shop’s property value has gone up and the Jardine’s can’t afford for rent not to be raised. Thrown into the mix is the instant best friendship of Jake and Cavelli’s son Tony, bonding on their artistic futures (Jake is an aspiring artist and Tony an actor). The friendship is doomed from the start because there is no possible resolution to the dispute over the shop. And it’s to the filmmaker’s credit that they don’t cheapen the story by having a happy ending. There is nothing to be done. And there is no way the boys’ relationship can be salvaged. 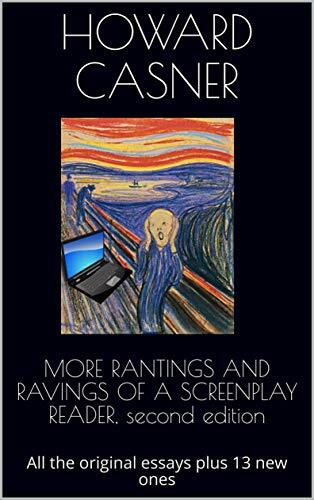 But the story, though entertaining enough, never really becomes more than that. It’s unclear why. One possibility is that there are two through lines, the dispute over the shop and the budding friendship, and because of this, one has to be short shrifted—here, it’s the friendship plotline. Another possibility is that the filmmakers try to make more of the situation than there is. It’s unpleasant, but hardly tragic. And it’s inevitable. Even if the Jardine’s didn’t insist on Carvelli paying more rent, the shop was on its way out. It’s not the Jardines who are the bad guys so much as it is time. And one can never defeat time. The most interesting aspect of the film is Leonor, played with a lasered intensity by Paulina Garcia, the glorious Gloria of the only so-so glorious Chilean film of the same name. Her character is fascinating and highly original. She’s someone who, though needing the Jardines to give her a break, does everything she can to alienate them, spouting bitter truths of how Brian’s father felt about him. It’s almost a how not to book on negotiating. Much has been made of the young actors playing the two boys: Theo Taplitz as Jake and Michael Barbieri as Tony, both first timers. And they do have an infectious energy and their chemistry is first rate (some of the best scenes are when they are doing nothing but riding a bike and roller skating, there’s something about these scenes that capture friendship that words can’t). One wishes the story had been even more about them. 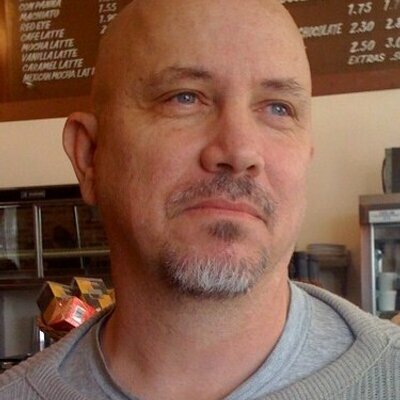 Gregg Kinnear plays Brian and he has a nice moment with Jake where he starts out giving what at first hearing seems to be a discouraging analysis of his son’s artistic aspirations, but it ends up being a loving endorsement. With Alfred Molina making the most of his cameos as a lawyer friend of Leonor’s.